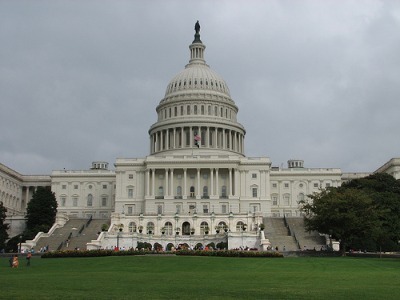 The House on Friday passed the Energy and Water Appropriations bill for Fiscal Year 2012. Included was an amendment adopted on a voice vote that would block the ban on standard incandescent light bulbs that is currently scheduled to start going into effect on January 1, 2012. The amendment was offered by Rep. Michael Burgess (R-Tex.). On Tuesday, the House failed to pass a stand-alone bill sponsored by Rep. Joe Barton (R-Tex. ), H. R. 2417, that would repeal the ban permanently. The vote on the Better Use of Light Bulbs Act was 233 to 193, but failed because it was brought to the floor under a special, expedited procedure that requires a two-thirds majority. Ten Republicans voted No, but more surprisingly only five Democrats voted Yes. Democratic support for repealing the light bulb ban collapsed when Minority Leader Nancy Pelosi (D-Calif.) and then the White House cracked the whip. The Energy and Water Appropriations bill also includes deep cuts for funding of renewable energy programs. The total budget for the Department of Energy and some related programs is $30.6 billion, which is only down $1 billion from last year, but is $6 billion less than President Obama requested. The House Appropriations Committee this week marked up the Fiscal Year 2012 appropriations bill for Interior, EPA, and Related Agencies. The bill as presented includes a provision to block implementation of the Environmental Protection Agency’s Clean Air Act regulations of greenhouse gas emissions for stationary sources (such as power plants). Several other amendments were adopted to handcuff the EPA from implementing new job-killing regulations. The most important was an amendment offered by Rep. Steve Austria (R-Ohio) that would prevent the EPA from moving ahead with new Corporate Average Fuel Economy standards for vehicles beyond the current requirement of 35.5 miles per gallon by 2016. The Obama Administration has announced that they want the CAFE standards to be raised to 54.6 mpg by 2025. Another amendment offered by Rep. Cynthia Lummis (R-Wyo.) that was adopted would require the EPA to do a cumulative economic and jobs impact analysis of all the Clean Air Act rules that the Obama Administration has proposed. Rep. Ed Whitfield (R-Ky.), Chairman of the Energy and Commerce Subcommittee on Energy and Power, this week held a hearing at which he explained how the Environmental Protection Agency colludes with environmental pressure groups to circumvent federal regulatory rules and the Congress. It’s well known and quite simple, but it was great to hear a Member of Congress understanding the scam and complaining about it. In testimony before Whitfield’s subcommittee, William Kovacs, Senior Vice President of the U. S. Chamber of Commerce, detailed how EPA invites and then settles friendly lawsuits from environmental pressure groups. The resulting consent decrees create new regulatory requirements that have not gone through the rulemaking process and cannot be overturned without legislation. Whitfield added that the federal government awards millions of dollars of grants to these groups annually and then awards them millions more in legal fees for “winning” their lawsuits against EPA. The Senate Energy and Natural Resources Committee on Thursday marked up the 21st Century Energy Technology Deployment Act (CEDA), which would create a federally-funded clean energy investment fund. It is not clear how much this “Green Bank” would cost, but it is clear that it is insane to be undertaking huge new spending commitments at a time when the federal government is facing insolvency. The bill was reported out of committee with the support of Committee Chairman Jeff Bingaman (D-NM) and Ranking Republican Lisa Murkowski (R-Alaska). Three Republicans opposed the measure: Senators John Barrasso (Wyo. ), John Hoeven (ND), and Dan Coats (Ind. ).